People spend approximately 90% of time breathing “indoor air” and unlike outdoors, indoor air is usually recycled continuously causing it to trap and build up pollutants. Indoor air quality (IAQ) is characterized by concentration of pollutants, as well as air temperature and humidity. The current challenge is to solve the problem of how to increase the IAQ especially in older or recently retrofitted buildings and how to adjust cost effectively the future retrofits to avoid indoor air quality problems without compromising the energy efficiency. A vital part of solving these issues is to identify and predict the air quality problems. This is where monitoring technology and analysis come into play. This use case will focus on smart and secure monitoring and analysis systems that can identify and detect issues with IAQ and provide information to perform adjustments and ensure a healthy indoor environment. The plan is to take advantage of the currently available sensors for measuring the IAQ parameters such as humidity, temperature and emission levels (e.g. temperature, relative humidity, CO2 / CO / NO2 concentrations) and apply emerging long-range (e.g. sub-1GHz) technology together with short-range (e.g. 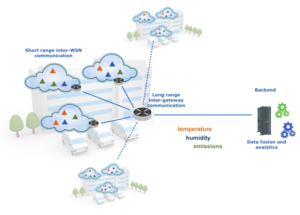 2,4GHz) technology to create hybrid WSN monitoring solutions. Currently, the market of the sensors has remained at the level of ensuring simple observations and controls in the buildings. By connecting wireless smart and secure monitoring solutions with sensor data fusion and analytics, new trustable services will be created that ensure lower energy consumption and a healthy indoor environments. Application of data analytics techniques to detect and predict IAQ issues, and to optimise the system parameters to maximise healthy and optimal indoor environments and lower energy consumption.